Maj-Lis and Joey’s personal mission is to share their happiness and joy with others through yoga. They are passionate and enthusiastic students of life who hope to inspire and support everyone they meet. Joey and Maj-Lis fell in love at first sight when working together in the retail wireless industry. Before meeting Joey, Maj-Lis was a dance major at the University of Northern Colorado. Maj-Lis has worked in retail management, bank management, marketing operations and project management for new-build residential housing for technology. Joey is currently the General Sales manager for an RV dealership with two locations in Colorado. Joey loves supporting his sales staff to help customers dreams come true. The accomplishment Joey and Maj-Lis are most proud of is their two children: Liam who is 10 and Lily who is 6. Liam loves sports of all kinds and is currently first base on his baseball team. Lily loves animals and music. Maj-Lis has been practicing yoga on and off for almost 20 years. 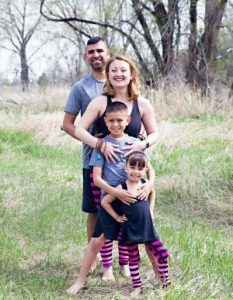 Yoga became a way of life after the birth of their daughter came through emergency c-section, and it took a physical and mental toll on her body. The open arms of the practice nursed her back to health, and beyond. She completed her 200-hour Yoga Alliance teacher training May of 2015. Joey and Maj-Lis live in Windsor, and love the small town feel. Between working and living in Fort Collins, Greeley and Windsor for almost 20 years, Northern Colorado has piece of their heart, and they are so thankful to be a part of the community.